This coin is a continuation of the silver Taku series from the New Zealand Mint that has grown tremendously in popularity in its brief existence. 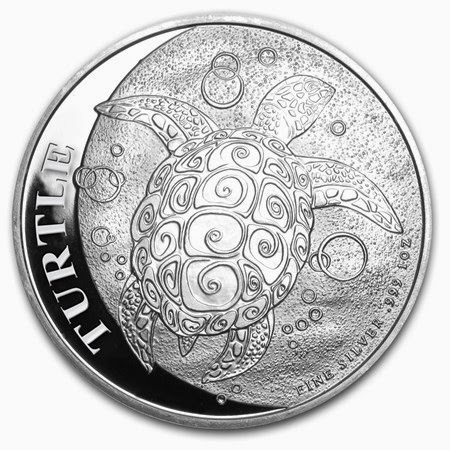 The coin combines the appeal of 1 oz of pure Silver with an elegant design that captures the beauty of the ocean! With a sleeker design and low mintages for bullion, these coins move very quickly. Coins come packaged in protective plastic flips. Strict limited mintage of only 200,000 coins. Obverse: New stylized design of a Hawksbill turtle, also known as the Taku, swimming in shallow waters amidst tiny bubbles. Reverse: Effigy of Queen Elizabth II and 2014 date. Multiples of 20 will come in plastic tubes; individual coins will come in protective slips. Hawksbill turtles are found throughout the tropical waters of the Atlantic, Pacific, and Indian Oceans. Named for their narrow, pointed beak, they are also recognizable by a distinctive pattern of overlapping scales on their exquisitely colored and patterned shells. This species typically avoids deep waters, preferring coastlines and coral reefs where they can find sponges, a primary food source for these omnivores. Beautiful creatures, they make incredible migrations in order to move from feeding sites to tropical beaches that often serve as nesting grounds. Hawksbill turtles come to New Zealand every year from Fiji; although they’ve been sighted as far south as Cook Strait, they are mostly seen in the upper North Island of New Zealand in the clear, shallow waters of the island shelve. Like many sea turtles, hawksbills are a critically endangered species due mostly to human impact. Hawksbill eggs are still eaten around the world despite the turtle’s international protected status, and they are often killed for their flesh and their stunning shells that are highly valuable in some marketplaces. A fantastically designed bullion item, this product has grown tremendously in popularity among investors in each of the four years that it’s been produced because of its intricate design. The New Zealand Mint is a privately owned company in Auckland, New Zealand. It is the only privately owned mint in New Zealand, purchasing refined gold from international sources to produce coins. They have established their reputation over the past four decades for their high quality design as exhibited by their innovative commemorative gold and silver bullion products. The only precious metal mint in New Zealand, the mint uses the tag-line “Minters of the South Pacific” and produces collector and bullion coins for a number of pacific nations, including Fiji, the Cook Islands, Niue and Tuvalu.